Yesterday while us moms got together to sign Christmas cards the kiddos were all gathered in our schoolroom for an edible, Christmas craft! They made sugar cone Christmas trees. This is such a fun craft for the kiddos, and they enjoy it so much because they can eat their masterpiece :) Most all my friends have small children, so I am always trying to think of creative ideas for the kids when they are over. It also allows for us moms to fellowship! 1. First I purchased all of our supplies a week before. 3. Invite guests in for the fun! 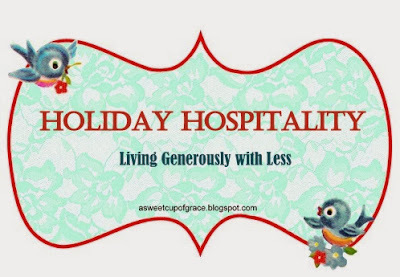 I hope you enjoyed Day 3 of our Holiday Hospitality Series! What are some ways you are opening up your home to others this Christmas season? I'd love for you to share!